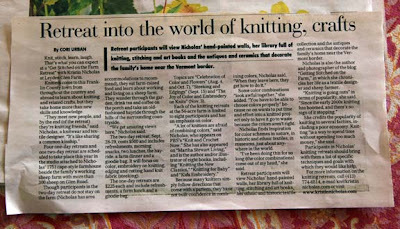 Kind of exciting news that my Knitting Retreats here at the farm got written up in the Springfield Republican! Did anyone see it? Next week starts the new series of knitting, color, and creativity classes here at Leyden Glen Farm. I've got a group of knitters who are coming back for the second time for a full weekend retreat. I can't wait to see them all again. One of the students is even adopting two of our new kittens. So nice that they are going to a knitter's home. Will be used to the yarn around! This year I am trying something different and hosting a series of One Day Retreats. The first is August 4th. It focuses on techniques that will be in my upcoming book (2013). You can read all about it on my class website here. There are only three two one no spots still available for the August 4th class. It is going to be a fun day of working with color and stretching your knitting and crocheting skills with a small group of knitters and crocheters. You do not have to be a great knitter or crocheter - just one with determination and curiosity. Class is sold-out. E-mail to be put on the mailing list! Our farm is 2 hours west of Boston and 3 1/2 hours north of NYC. Bring a friend or come by yourself. Everyone is really friendly and we will have a great day. And now what you have all been waiting for..... this has got to be the cutest kitten photo.... I didn't plan this - it just happened. 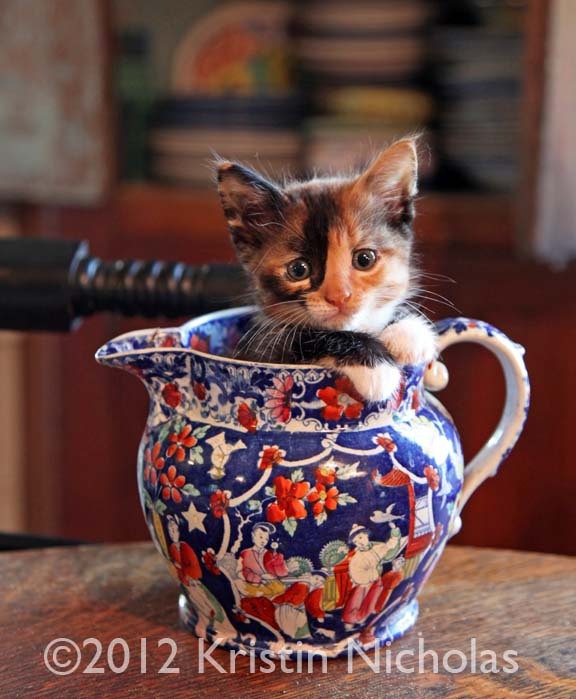 Little Delilah has taken a liking to a pottery jug I usually have flowers in. Is this just too much? I may have to make prints for sale. Anyone interested? OMG! Delilah is just too cute!! Oh yeah! That's a seller for sure. The photo, I mean. The kitten is a keeper! Oh, what a sweet darling! Wishing again I could take a class. Fantastic and yes please do make that one into cards! She certainly knows how to work her dear little self right into your heart! Oh yes, that IS the cutest kitten! Love the kitten in the pix. But, quess what, I loved the whiskers on that black and white kitty even more! It's probably crazy but that was the show stealer for me! Is that the kitty that is available? Such an adorable kitty!! Does she get in your yarn bags too? yes, you should definitely use this photo!! The photo would make beautiful note cards! One day retreats is a wonderful idea. I would sign up in a moment but my mom is ill and needs to be moved to nursing home. Sorry, thats a bit personal. Hope you run the one day flower and color again after November. Count me in as a participant. Looking forward to your next book. Visited a LYS and a pair of knitted socks were hanging aaa a sample. I kept looking at them and finally asked for the pattern. They are in your Color book which I alread own. I need your help! Internet Explorer doesn't work on my computer, so when I click on the link to email you, it doesn't work. I have a question about the knit hedgehog pattern that you did on Knit and Crochet Now!. In the stitch key, it reads, "Inc - Increase in the stitch and knit the stitch from which you increased in." Of coarse it was the only thing that you didn't demonstrate on the show, and I have no idea how to accomplish that stitch. Could I just kf&b instead, or would that mess up the panel? Your help would be much appreciated! Notecards, magnets, posters, t-shirts! So adorable! I do not remember the pattern but I am guessing any kind of increase will work. Good luck. Check out Knitting Help.com. They have tons of videos of different increases. 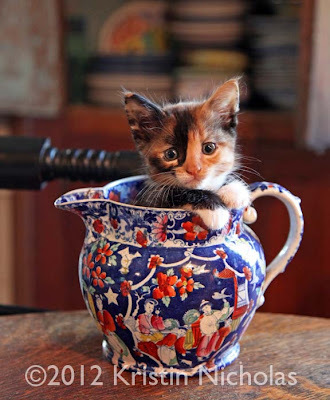 The combination of calico and other colors of the pot is just wonderful! Delilah is also very cute. Thank you so much Kristin! Now I know what to do if I ever come across those instructions in future patterns. You're the best! Yay for sold out classes! And that kitten..omg. That is all. I do have to agree, this is just about the cutest kitty picture I have seen. Such a sweet little kitten.